In 1994, Khutzeymateen was designated Canada's only grizzly bear sanctuary under the joint management of the province of British Columbia and the Tsimshian Nation. Located 45 kilometres northeast of Prince Rupert on BC's northern coast, Khutzeymateen, provides about 45 000 hectares of protected wilderness for the grizzly. 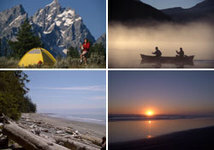 The topography of this land and marine sanctuary is diverse, with rugged peaks towering to 2100 metres above a valley of wetlands, a large estuary and old growth temperate rainforests. This sanctuary provides refuge for about 50 grizzlies. It also represents the first undisturbed estuary of its size to be protected along the north coast of BC. An abundance of wildlife shares the area. The Park’s rich wildlife population includes moose, wolves, migrating owls, grouse, shorebirds, geese, harlequin ducks, kingfishers and harbour seals. Orca and humpback whales move along the coast. The ultimate purpose of this area is to protect the north coast grizzly bear by preserving a part of the ecosystem in which they live. Visitor use is not encouraged because of this area's high sensitivity and strict conservation orientation. However, viewing is allowed under permit. All guided tours must be with a permitted guide. Currently, there are two licensed guides in the Khutzeymateen Grizzly Sanctuary. The hunting of grizzly bear is prohibited and hunting of other wildlife is restricted to areas above 1000 meters elevation. When you arrive in the Sanctuary, please check in at the Ranger Station in the inlet. Once in the Khutzeymateen, there are very specific rules and regulations. There is no land access permitted in the Sanctuary and the river estuary is closed for public access. More information is available at the interpretive centre, which is located at the ranger station and open to the public. When using the inlet as an overnight anchorage, be aware of tidal fluctuations, particularly near the estuary, where water depths can vary considerably. High winds are also frequent in this area. Boaters entering the sanctuary should keep to the centre of the inlet to avoid disturbing bears. Fishing, hunting and camping are prohibited in the sanctuary, and angling is prohibited on the Khutzeymateen River and tributaries. The watershed of the Khutzeymateen River has long been an important hunting and fishing site for First Nations people, notably the Gitsiis, one of the nine tribes making up the Allied Tsimshian Tribes. The park was created in partnership with the Gitsiis people and is managed jointly with BC Parks and the Tsimshian Tribal Council. K’tsim-a-deen means “valley at the head of the inlet” in the Tsimshian language. Canada still represents the last country in which bears survive in any significant numbers. In British Columbia, the population of grizzly bears, Canada's largest carnivore, ranges between 4000 and 13 000. Their diet includes grass and roots, wild berries, insects, fish and other animals – salmon is the mainstay of their diet. The reproduction rate of a grizzly is one of the slowest of any land animal in North America. Whereas females require a home range of no less than 27 square kilometers, the male may need as much as 1350 square km of pristine wilderness. Habitats may be mountainous areas, salmon estuaries of BC, or the treeless tundra of the Northwest Territories. Thousands of peaceful human/bear encounters occur every year, however, 16 fatal attacks have been recorded in BC over the last 20 years. Khutzeymateen takes its name from the Tsimshian First Nations word that means “sheltered place of fish and bears”. The park protects a population of approximately 50 grizzly bears, some of which are estimated to weigh 400 kg. The protection of the dwindling grizzly bear population in British Columbia is vital, as the loss of their natural habitat continues to threaten their survival. In addition to protecting grizzly bears, their habitat, and the ecosystem in which they live, the park also represents the first undisturbed estuary of its size to be protected along the north coast of BC. Khutzeymateen Grizzly Bear Sanctuary is 45 km northeast of Prince Rupert, in the Western Kitimat Range of the Coast Mountains. Access to the sanctuary is by boat out of Prince Rupert, or air from the nearest major towns of Prince Rupert, Terrace and Kitimat. For guided tours, call the Prince Rupert Visitor Info Centre for information at 1-800-667 1994 or (250) 624-5637.